Zone 1 Tube station on the Circle and Metropolitan lines. It's also a very short walk from Aldgate East Station on the District and Hammersmith & City lines. 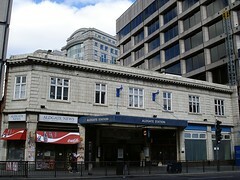 It has a single exit onto the north side of Aldgate High Street, opposite a bus station. Last edited 2013-12-14 06:33:54 (version 9; diff). List all versions. Page last edited 2013-12-14 06:33:54 (version 9).